I went on an inspiration hunt right away. The thing with me and my ideas is that I change my ideas a million times to the very last moment. Sometimes it is good, cause not everything turns out the way we plan it at the beginning, but sometimes it is really hard, if you need to buy all the stuff and cannot stick to one plan. Anyway.. I didn’t really find what I was looking for on the internet, so I just made a mental picture of my idea and kind of stayed with it until….the day I started modeling the figurines with gum paste. I decided that instead of just putting them on top of the third and second layer of the cake, I wanted them to “do” something. So, Maya got the responsibility to present the number two. Willy – the other bee- is taking care of my niece’s name and Flip.. well… he was a little too unstable to have a task (I think he is just the coordinator in this scene). 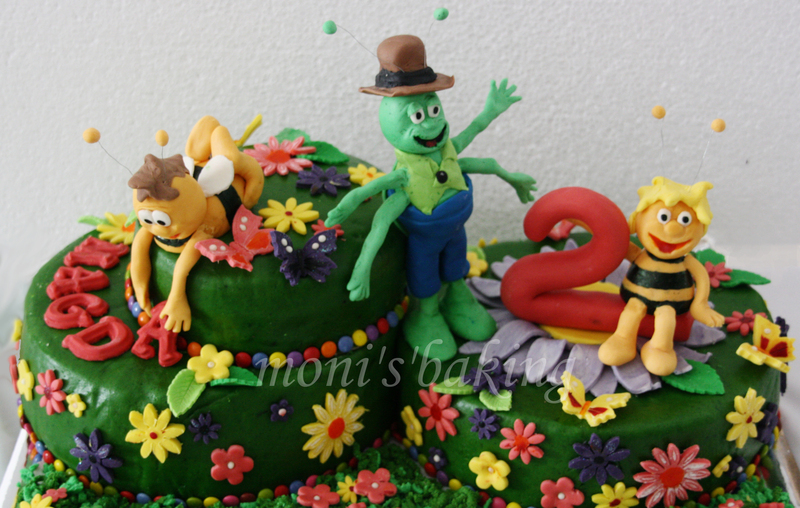 He would simply look cute and complete the Maya the Bee crew. The three characters were a lot of work. I think it took me 11 hours until all of them were more or less sitting, standing and not falling apart. I printed some pictures from the internet in order to be as close to the original as possible. The next day I made the cakes (one with a buttermilk-lemon-rasberry filling, one with an egg liqueur filling and one with a chocolate buttercream-pudding filling – of course, the kids did not have the second filling. They are not big fans of cream cakes anyway). For the decoration I took out all the fondant cutters I had.. different kinds of flowers, leaves and butterflies. With several colors of fondant I created the basis for a flower meadow. I covered all cakes with ganache and green fondant (which I made a couple of days before). I left the cakes to chill and started to decorate the day of the party. To have more space to decorate (the figurines were big and I made a lot of flowers) I put the two big cakes next to each other and the small cake on top of one. Btw. the two lower cakes turned out to be the same size, although I did not have two equal pans. I used a method to avoid that the fondant touches the filling (the fondant would melt). For that you need to cut the edges of the cake and put it on top of the first layer (inside a cake ring). If you have two or three layers, you need to cut the border accordingly. Also, of course the border is a little too long, so you can shorten it. There are pictures of the process on Tortentante.de, where I found this method. It really works and when you make one border thicker than the other, you can adjust the size of the cakes a little. Additionally, my smaller cake got a little more ganache, so that at the end both cakes came out almost twin like.. almost, because I made one of them smaller in height. I used two eggs less in the batter and less cream filling. 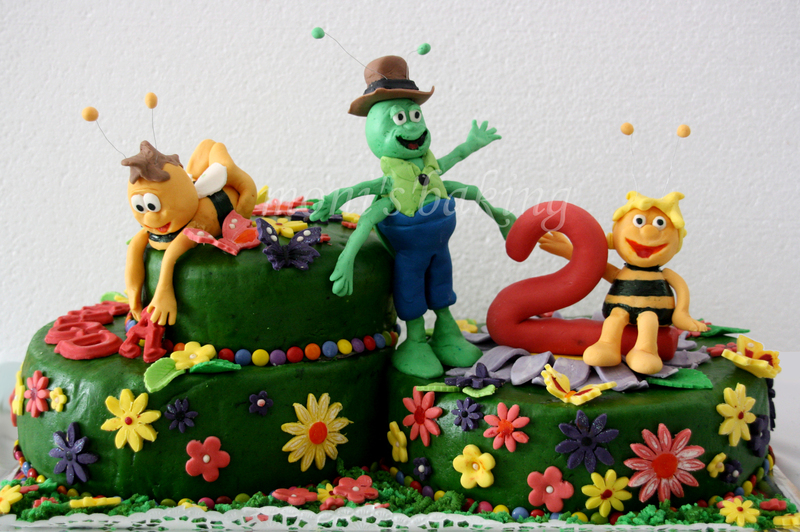 With that I achieved a slight difference, which makes it a little less boring and gives Flip some support when he leans against the higher cake. With edible glue me and my sister decorated the cake with Maya and her friends, butterflies and flowers. At the bottom of each cake we made a border out of colorful candy. To cover the tray I sprinkled grated green fondant in different shades. Hope you have a great and not too beesy week ahead!